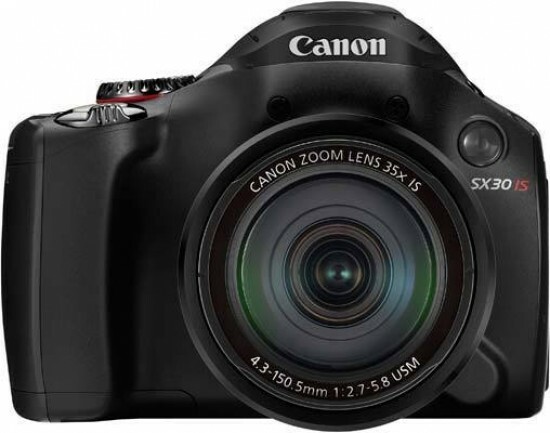 The Canon PowerShot SX30 IS leaves other super-zooms trailing in its wake in terms of sheer focal length, with the 24mm wide-angle and 840mm telephoto settings providing more than enough versatility to meet most people's needs. Thankfully Canon's engineers have also implemented a very effective image-stabilisation system, which along with respectably bright maximum apertures helps to keep the majority of your shots sharp. Unfortunately the longer lens and move to a 14 megapixel sensor doesn't do the SX30's image quality any favours, especially in low-light, and the official price increase puts it into direct competition with other premium super-zooms, entry-level DSLRs and compact system cameras. Being able to shoot 720p high-definition video complete with image stabilisation, stereo sound and the ability to make full use of that incredible 35x zoom is a real attraction and something that no other compact camera can currently match. Unfortunately the story isn't quite so rosy with regards to the SX30's still images, with noise and loss of fine detail appearing at the relatively slow speed of ISO 400. It seems that the move to more megapixels has compromised the overall image quality at higher ISO speeds, limiting this camera's ability in low-light environments. Also of concern is the now more obvious chromatic aberrations which rear their purple and green ugly heads wherever there's an area of high contrast in the image. As with the SX20, several key features have been sensibly retained - the tilt-and-swivel LCD screen, dedicated record button for instant video clips, electronic viewfinder and external hotshoe all make the SX30 IS an appealing digicam for the keen hobbyist, especially with a full range of manual shooting modes on offer. The only fly in the ointment is the continued absence of a RAW file format, pushing would-be Canon buyers to the G12 or S95, currently the only Canon compacts that offer RAW shooting. Several rival super-zoom cameras also support RAW, most notably the Panasonic FZ45, Fujifilm HS10 and Olympus SP-590 UZ, so there are other alternatives in the same category if this is a must-have feature. So while the 35x lens is a real headline-grabber that lives up to most of its promise, the SX30 as a whole still suffers from a few notable problems - less than stellar still images, lack of RAW shooting, a significant price increase on launch and few real upgrades over the previous model. Ultimately the SX30 proves the old adage that there's no such thing as the perfect camera, despite featuring the most versatile focal range ever seen on a compact.